How much whipped ricotta + [insert any carb] would be appropriate to consume? HOLY SMOKES! I love that whipped ricotta! So yummy! Just the ‘whipped ricotta’ part of your title hooked me when we’re talking about pizza! White pizza has been a favorite of mine ever since I was enticed by the boardwalk version circa 2000, but seriously ever since I made my own version at home and tasted how incredible it really was. Shaved asparagus sounds like a wonderful hint of something green without overpowering the pizza. Oh, Strawberry Wine… I remember that one! I steer clear from most cheese because I’m just not a fan (nor is my tummy), but I agree with you that whipped ricotta is the only way to go. Sounds like an awesome pizza topping! I love whipped ricotta! It totally changes the texture, as you say. This pizza is gorgeous and sounds SO good. And yes, i was doing all those same things back in 1996. Looks and sounds so yummy! But I’ll be honest, the first thing I saw was shaved asparagus and whipped….and the thought of some summer shaved ice drink with asparagus flavor entered my mind, umm gross. This is much better than what flashed through my mind for a split second, can’t wait to try it. Recipe looks amazing as well! I also pulled up Spotify and am now cruising down memory lane listening to it :) Great stuff!! I’m doing this now too! Whipped ricotta is the BEST! Will you feed me? I want this. Also the pizza looks great. Haha. Why do you even eat pizza out when you make such perfect-looking pizza? My only question. Now I’m inspired to make a Strawberry Wine inspired dish….. golly I love that song (STILL, no apologies). I absolutely love the flavors on this pizza! Looks so delicious, I think I need a piece now! Pinned! Beautiful! I’d love a slice of this. Or two. Or four. By the way, in my mind, I’m totally saying whipped ricotta in the styled of Stewie Griffin. wHipped ricotta. 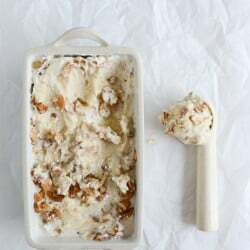 I already love ricotta, but i think this might make me love it even more! Another GORGEOUS pizza- IN LOVE! You’ve stolen my heart with this recipe. My favorite pizza toppings are green peppers and pineapple, so I’m all over this pizza with a few topping subs :) It’s not even noon where I am but whipped ricotta pizza just sounds like everything I’ve ever wanted. PS–I just bought Too Faced’s Milk Chocolate Bronzer (I have fair skin too) because I’ve seen it on your blog and yeah, you’re right–for fair skin, this is pretty much the best bronzer I’ve ever tried! Thank you for that! Now I have that song in my head and I want that pizza in my face! Grilled pizza is on my summer bucket list too! And I’ll definitely try this recipe. Totally hear you on the scary movie thing. I think my friend and I managed to watch the entire Halloween series during the summer of 96. This looks so yummy. I love your pizza crust recipe. Also, where are you finding sharp provolone? I’ve had it before and love it but can never locate it to purchase. Some provolone has no taste at all but the sharp stuff is de-lish! Eff ME this looks sooooooooooooo good. This pizza looks so good, I can almost taste it. Plus that’s a killer crust. Awesome! Yum! I love pizza! Who doesn’t?! This looks amazing! I like how you used shaved asparagus. I never had asparagus on pizza before but it sounds great! omg omg. the waiting to exhale album was one of my favorites for YEARS. i still listen to it on itunes. so good! Strawberry wine!! OMG!!! I LOVED that song! Whatever happened to her?? Such memories – thank you! Can’t wait to try this pizza! Your BLT pizza is a staple in our house. Best.pizza.ever. Yes please! Love Strawberry Wine, love asparagus, love ricotta cheese, love it all! All of your recipes are GOLD! I’ve been following you since 2010 and I have yet to see something on here that doesn’t inspire me! Thanks for yet another lovely foodie idea!! Well I am with the person who was drawn in with Whipped Ricotta—Me too. I am a MAJOR ricotta fan to start with. This is a very fascinating pizza recipe. Artisan pizzas rock. And this is a star quality one. 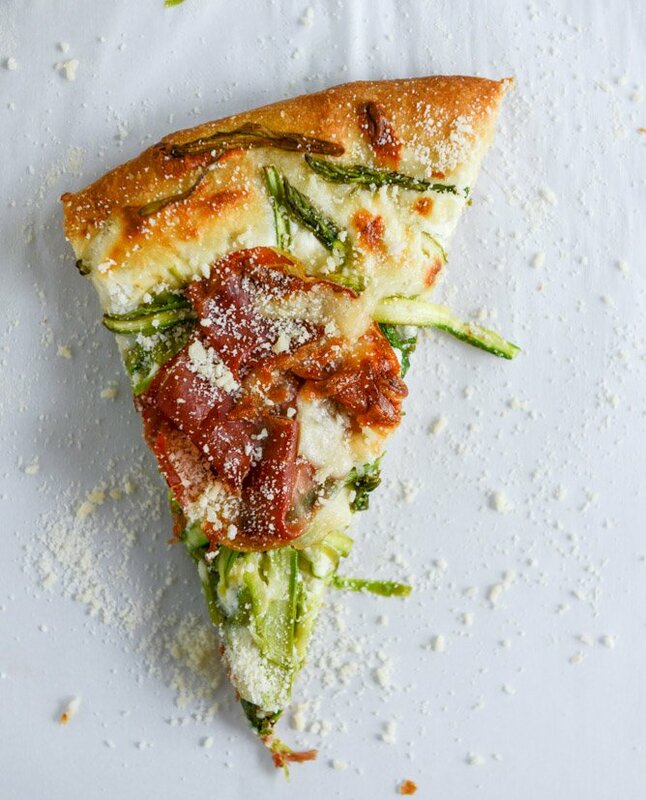 I didn’t like asparagus as a kid, too, but now I LOVE it and this pizza looks delectable! I wasn’t even born in 1996 and I still love that song! Also, I love asparagus ribbons.. so much fun! I even made ‘pasta’ out of them once by blanching them in boiling water for a few minutes and adding pesto. Yum! This pizza topping sounds and looks so good! I love everything about this pizza! I also love Strawberry Wine! Oh my word – this looks amazing. Pinning ond putting on the short list for the next time I make pizza, which will need to be soon! Wow! I think this is better than those in Pizza Hut/Domino/Shakey’s Pizza :D Haha.. This is one special combination I ever seen for pizza. I like it! Hi Jessica! What type/brand of pizza stone do you have? Thanks! I love literally everything about this post. But mainly the pizza. Can’t wait to make it!! I want this so bad. I love ricotta but my husband does not. I am all about the trickery.